The ATEN CV211 connects a laptop directly to any server giving you instant access to perform data maintenance and local operations for quick troubleshooting, updating, service and repair. Additionally, BIOS level access gets you into a server's BIOS during hardware and operating system failures. In our mobile age, this solution significantly reduces maintenance time for IT engineers and administrators, especially when no Internet access is available or permitted. Direct desktop "access on the go" has never been easier. 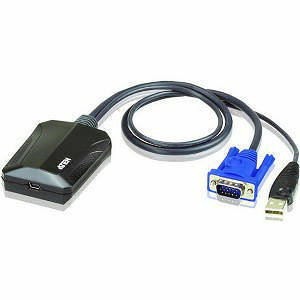 ATEN's CV211 Laptop USB Console Adapter provides an effortless Laptop-to-Computer connection for quick and easy remote desktop access - no additional software required. The CV211 gives you complete control with the tools you need to troubleshoot IT issues, all in a small portable adapter.